Vacation rental house. 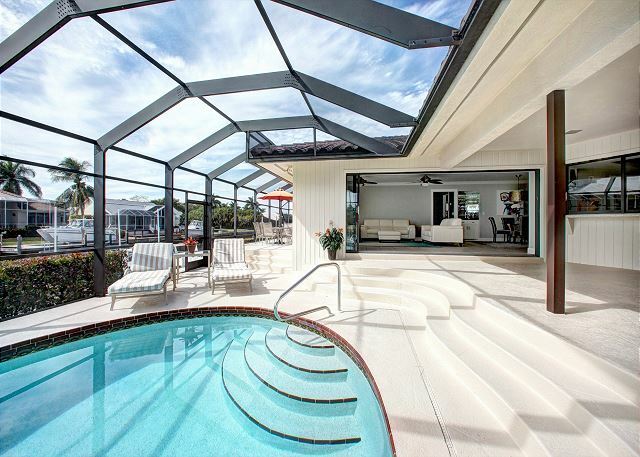 Sleeps 8, 4 bedrooms, 2.5 bathrooms. Dogs allowed. 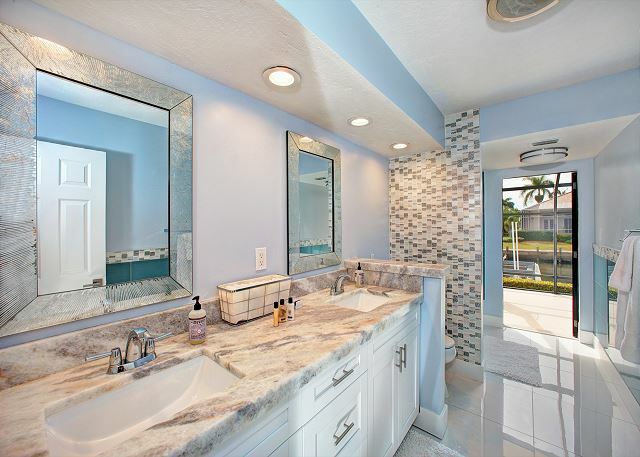 Modern and bright, Barfield sits on a corner lot surrounded by over 250 feet of water frontage on two sides! Sun decks are flooded with picturesque afternoon light and coveted Southwestern exposure makes this home perfect for evening entertaining. 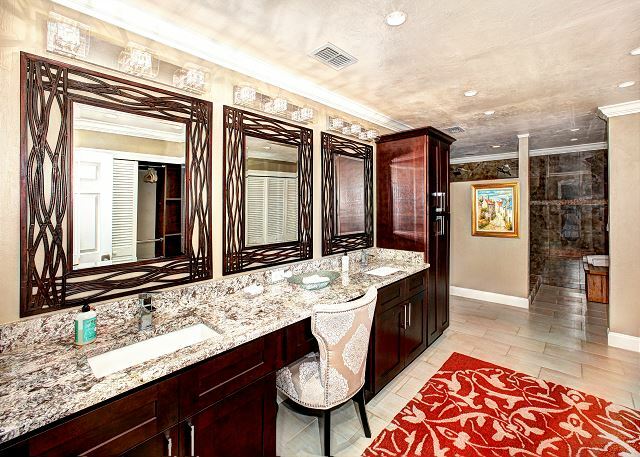 The den off of the kitchen offers phenomenal long water views right from the sofa. Lounge and enjoy your favorite show or sports game on the mounted flat screen while friends and family enjoy the pool right outside. Florida living at its best! 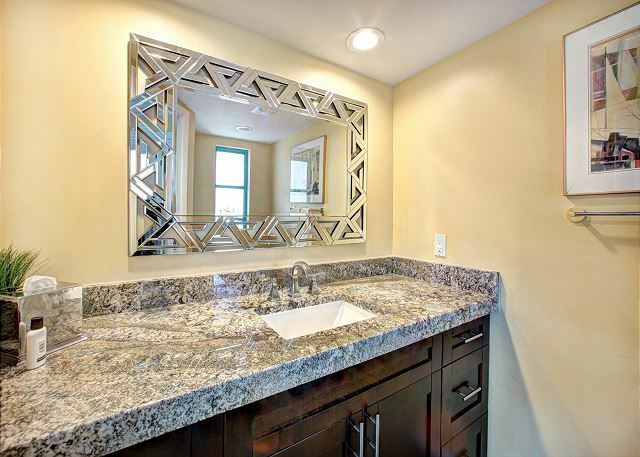 Inside, Barfield has been recently remodeled in a coastal modern style, including an all new kitchen and artful granite bathrooms. 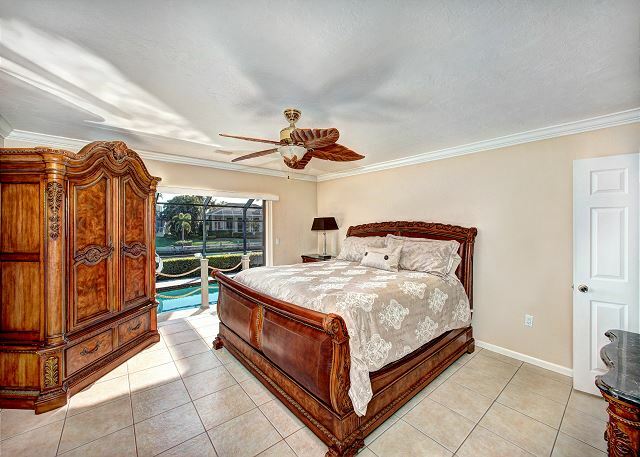 3 of 4 bedrooms plus the den and living room have HDTVs with DirecTV service and the home has high speed WiFi. Luxury linens and super comfortable beds complete the package – you won’t want to go home! 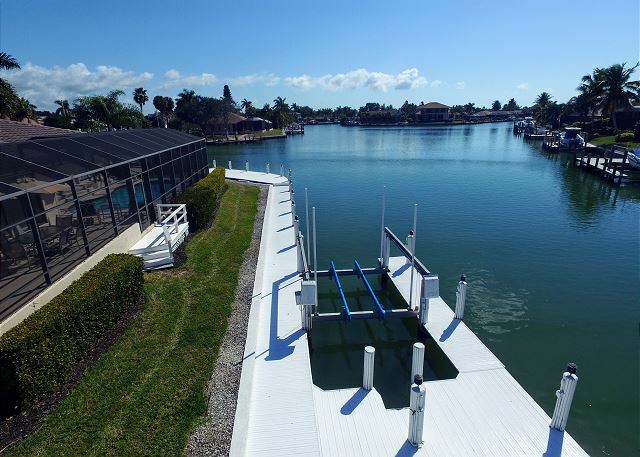 Plenty of dock space means your boat is welcome and the home’s boat lift is available upon request, for a small additional fee. *This home is selectively dog friendly, with approval. Please include your request to bring a dog in your inquiry! Additional pet fees will apply. 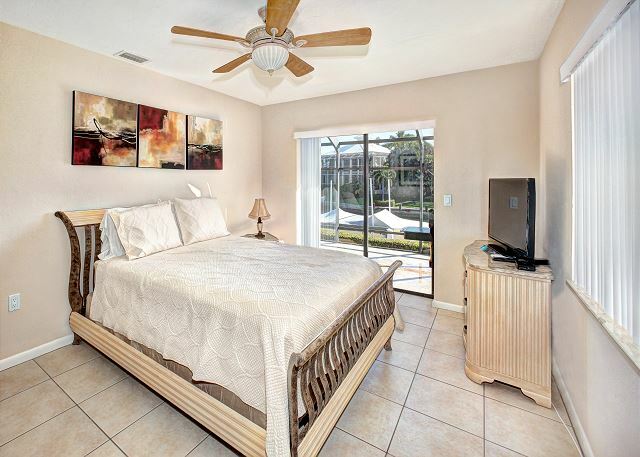 Beautiful home in convenient location on Marco Island. Our family of 5, with 3 adult children,plus my 83 old mother, had a wonderful time at the Barfield house for our Christmas vacation! The views were spectacular. The house was immaculate and well stocked. We used the dock and pool all day and took the short drive to the beach each evening for sunset. We already booked for best Christmas. Wow Susan! 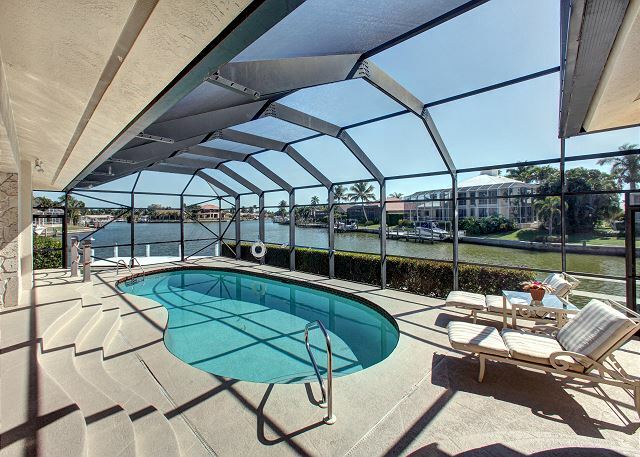 Sounds like your family had an unbelievable vacation to Marco Island! We are so happy that you had a great experience at Barfield. Can't wait to host you again next year! Everything was perfect. Could not ask for anything more in the home. Everything was beautifully decorated. We had everything we needed to stay in or go out. I had ordered bikes but didnt need to. There was only one little minor thing I would have liked to do and that would have been to launch kayak or paddle boards off the dock. But the ladder was too full of barnacles. Even with shoes it would have ripped up your hands. Replace that, and this place is nirvana!! Thank you so much, Michelle! We are thrilled that you loved the home and had a wonderful vacation. We will have that ladder replaced asap - see you next time! 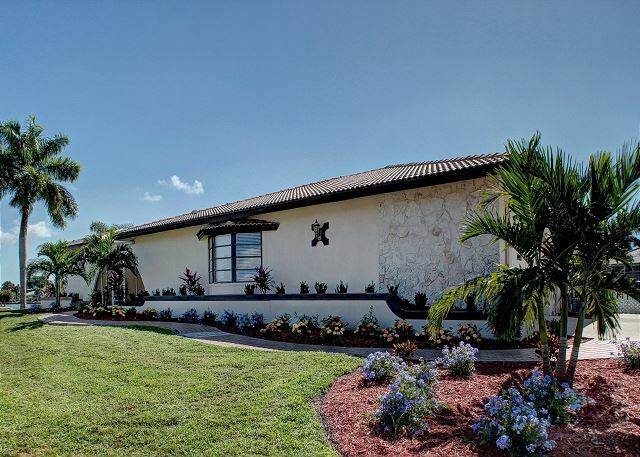 Beautiful home, clean and modern appliances and great waterfront corner lot! Bedrooms were spacious and comfortable and the bathrooms were very nice. Great kitchen, well stocked with utensils and cook ware. Modern stove, new refrigerator and dishwasher. 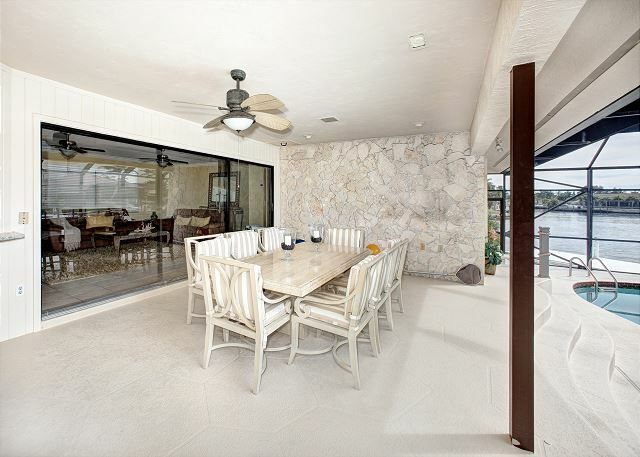 We loved the large screened-in lanai. Only issues were the sliding dock locks were non functional, but that did get addressed within a few days after inquiry. Also, water temperature in the showers was usually tough to get warm and rarely got hot, regardless of the time of day or usage of the showers. Holiday Life staff were helpful and professional. The property manager was courteous and friendly and was able to fix the locks on the sliding doors. The location was a short drive to the beach and shopping. I would definitely recommend this property! Thank you, Jeanne! We're thrilled that you enjoyed your stay in Southwest Florida! Sounds like you had a wonderful vacation. See you next time! Our family of 8 vacationed at this home for a week in July. The home was nice and very spacious. It definitely could use some repairs for example the pocket doors being hard to open in one of the guest rooms and the drains in the bathroom not working well. The location was absolutely perfect and the kids really enjoyed the pool. This home only has a DSL internet connection so the kids were not able to stream any movies on their iPad but they did have a DVD player. They have a large table outside on the patio but in July it's too hot to eat outside so we found ourselves having to eat in odd places in the house because the table in the house only seats 4 people. The house was comfortable and we would recommend this home to our friends for a smaller group. I'd like to start off by commending the property managements excellent customer service. They were always quick to respond even to the smallest questions. The property is EXACTLY as pictured. The house is perfectly laid out. We stayed as 1 of 2 families. So 4 adults, a 7 month old, a 7 year old and a 2 year old and never once felt crowded. The outdoor area is where we spent majority of our time and I can't stress how much we didn't miss the beach. The house had EVERYTHING you need..beach towels, fishing gear, bikes, etc. I am a clean freak and found myself at ease in this house. It is immaculately kept. The beds were comfy, linens were so soft and the bathrooms were huge and updated. The house is in a great location as well. You could be to multiple stores, Starbucks and restaurants in under 5 minutes. If you are on the fence take my advice and book the trip. You won't be disappointed. We are already planning a return trip. Great location, beautiful views. The house is great overall, although needs minor repairs.